At Twincraft Skincare, we strive to be proactive, not reactive, with our customers and new product innovations. Any time we meet with a customer, we meet internally to ensure we’re collaborating to bring the best new ideas and solutions to the table. Sales, marketing, manufacturing, and members of the R&D team come together to discuss new trends, the brand’s DNA and existing products, industry benchmarks, and potential roadblocks. From these meetings, the sales team is prepared to work with the customer to meet and hopefully exceed their needs with new innovation. For both bar soap and liquid skincare, we take product concepts and bring them to life in our labs. We perfect your ideas in a small scale environment, and once we have formula approval, we move forward with testing and scaling up the formula. Many of our formulas are natural and do not use harmful preservatives, so this process can take longer than it would with more conventional ingredients, but we work very closely with our business partners to ensure transparency along each step in this process. 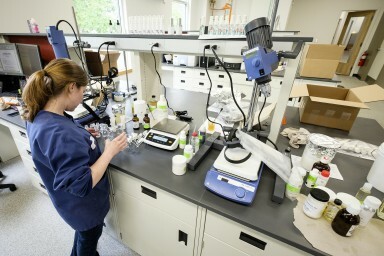 Members of our sales and formulation teams work hand-in-hand with our packaging department to ensure that each product is designed to work with the most appropriate packaging available. Our team understands that packaging is a crucial part of any brand’s persona, and we work with each business partner to ensure that we meet your needs, whether you’re providing your own packaging components or are looking for guidance from us for sourcing. Bar soap and liquid skincare products need to undergo rigorous testing to ensure customers receive products that will last for their intended shelf life, and will represent each brand’s own high product standards. Our in-house teams are available to answer your questions and provide required documentation and assistance during every stage of the product development and launch process.